A handsome young New York professor comes to Phoenix to research his new book. But when he's brutally murdered, police connect him to one of the world's most deadly drug cartels. This shouldn't be a case for historian-turned-deputy David Mapstone - except the victim has been dating David's sister-in-law Robin and now she's a target, too. David's wife Lindsey is in Washington with an elite anti-cyber terror unit and she makes one demand of him: protect Robin. This won't be an easy job with the city police suspicious of Robin and trying to pressure her. With the sheriff's office in turmoil, David is even more of an outsider. And the gangsters are able to outgun and outspend law enforcement. It doesn't help that David and Lindsey's long-distance marriage is under strain. But the danger is real and growing. To save Robin, David must leave his stack of historic crimes and plunge into the savage today world of smuggling - people, drugs, and guns - in Phoenix. Arizona's "History Shamus" returns in South Phoenix Rules. It's the most gripping and personal David Mapstone Mystery yet. 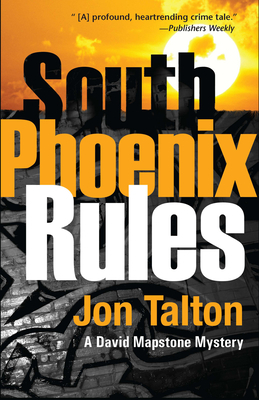 Jon Talton is the author of eight novels, including the David Mapstone mysteries as well as The Pain Nurse. He has been an editor and columnist for the Dayton Daily News, Cincinnati Enquirer, Rocky Mountain News, Charlotte Observer, and Arizona Republic. He lives in Seattle where he is economics columnist for the Seattle Times. Visit him at www.jontalton.com.